From Gas Street Basin where the BCN meets the Worcester and Birmingham Canal at Worcester Bar, you walk towards the ICC along a towpath full of shoppers, over the bridge next to the Malt Shovel pub where President Clinton once enjoyed a pint, to the NIA and turn right. Opened in 1789 by the Birmingham Canal Company, later the Birmingham Canal Navigations Company, and with a long succession of wharfs, the Birmingham and Fazeley Canal was constructed to connect with the Coventry Canal. Planning the canal began nearly a decade earlier but construction was delayed through bickering between the canal companies and allegations of poor workmanship. 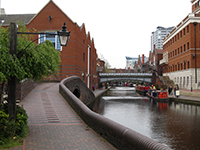 When finished, the canal transformed Birmingham from a terminus into a through route from the Black Country. As such it was worked 24 / 7 and became choked with working boats, resulting in the subsequent building of the Birmingham and Warwick Junction Canal. Passing the old Toll House, you start to descend 81ft through the Farmer's Bridge Locks or 'the old thirteen' with Cambrian Wharf and the former Newhall Branch to the right. Overshadowed by modern apartments and office buildings under which the canal disappears, you skirt the Jewellery Quarter. The Bottom Lock and Barkers Bridge are only reached after passing through a huge cavern carrying railway lines to Snow Hill Station. Aston Junction, where the Digbeth Branch departs through Ashted Locks to the Typhoo (Tea) Basin and Grand Union, is the first piece of greenery you'll see since the City Centre. Then the Aston flight of locks drop the canal by another 70ft. and for some time it seems as if the world has turned its back on the canal. However, as the Lock Cottage at Thimble Mill Lane is approached,.you'll see that even bluebells can flourish here in the spring. The canal now opens up to some extent but you wouldn't call it pretty as you continue over a succession of disused wharfs and arms until Cuckoo Wharf moorings. with Salford, and above it Spaghetti, Junction looming in the distance. Bearing right at the junction, you'll find yourself with canal on one side, refuse strewn River Tame on the other and a motorway overhead. Soon after these delights there's a large electricity sub-station and you disappear again under a factory built over the canal before emerging at Erdington Hall Bridge. Believe it or not the canal becomes a lot greener but largely uninspiring as you pass more scrapyards. There's even a neat little housing estate which is predictably followed by a monolithic, nameless warehouse. Approaching Tyburn Bridge, look to the right and there's the famous Fort Dunlop and the Jaguar factory that was the main manufacturing plant for Spitfires during the war, with a memorial on the adjacent Spitfire Island designed by JRR Tolkein's grandson.. Walking parallel to the busy Kingsbury Road, Minworth Top Lock is soon reached and the former Cincinnati factory with its eponymous bridge. Nothing particularly of note now happens but the outlook improves with smart canal side houses and willows weeping in the water until the Boat Inn and a refreshing libation just before the city.boundary.